Changing behavior isn’t easy. Not only does it take a lot of hard work, but it requires a concrete process that you can trust and follow on a daily basis. Where most training classes try to teach you new ideas that can counter what you believe and even violate your values, we help you to harness your personal Foundational Core Values and give you concrete processes you can use on a daily basis. 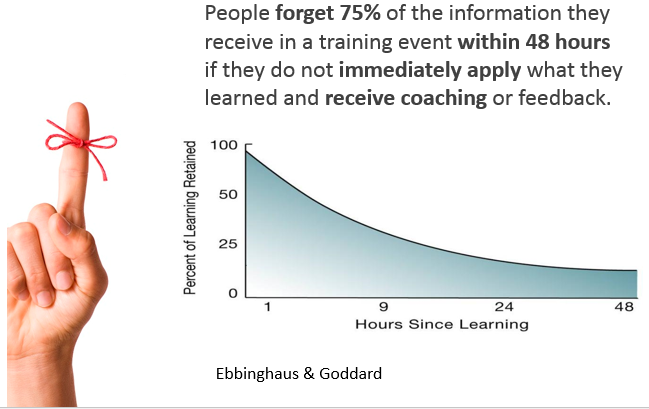 We typically lose approximately 75% of what we just learned within 48 hours unless there is accountability to apply the material. Because of that, we have a seven (7) week program to help your people apply the material they learned. We start with a one day seminar, and have six (6) one hour follow up’s by phone. Between phone calls, your team will be applying the principles they have learned, and on the calls they will be reporting back what they have learned. The spacing effect studies indicate that having the follow ups too close or too far apart decreases recollection and application of the material learned. That is why we space our follow ups one week apart. 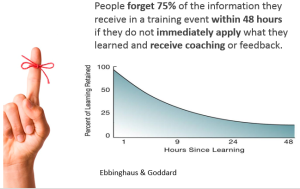 We have found that it is the perfect amount of time to apply what they are learning that week, and not so long that they forget about it between calls. By creating six (6) follow ups to apply the information they learned in the kick off seminar, spacing them one week apart, and limiting the amount of information in the follow ups to four (4) pieces of information, we have been able to increase the retention and application of the material in our seminars with our participants.